As you travel, you will need a suitcase. However, due to the many options on the market, it can be mind-boggling to figure out which is the best travel suitcase to own. One way to get closer to a decision is to assess your needs. What will you be carrying? Where are you going? Are you traveling for business or leisure? Will you be checking the bags on an airplane or throwing them in the trunk of an automobile? These three tips will help you to choose the best travel suitcase for your needs and specific mode of travel. The best travel suitcase should fit in your items without squeezing or leaving too much space. However, remember that you can always reduce the number of items you are carrying so that they can fit in the suitcase. You should choose a suitcase that you can handle without assistance and one that meets the size requirements of the airline you will be using. If you want a carry on, then it should not be larger than 45 inches when you add length, width, and height. An ideal carry on measures 22 inches by 9 inches by 14 inches. If you have more items, you can opt for a checked suitcase that is not bigger than 62 inches. Always opt for a suitcase that is below 27 inches not unless you are checking a single suitcase for two people in which case you can use the 25-27 inches large checked bag. Note that most airlines limit the amount of checked luggage to 50 pounds or 30kg. It is better to have a smaller suitcase so that you don’t pack unnecessary items and exceed the acceptable limits. Travel suitcases come with many features and it is up to you to decide the ones you need. Remember that the more the features, the heavier the suitcase becomes. If you want to use lightweight suitcases then go for few but essential features. Choose a not-so-common color so that you can differentiate your luggage from the others. Do you prefer a 2-wheeler or a 4-wheeled suitcase? The two-wheeled one is lighter and easy to maneuver but it can tip over if not balanced. The four-wheeled one can stand upright but needs a locking system to remain still. If it has 360° spinner wheels the better since it will be easy to control and move. A security lock ensures that your luggage is safe. However, it should be TSA approved to make it easy for the TSA agents to open using their universal key to check the contents. You don’t want a suitcase that will tear or break handles in the middle of your journey. Chose a suitcase made using high-quality materials that can withstand travels pressures. 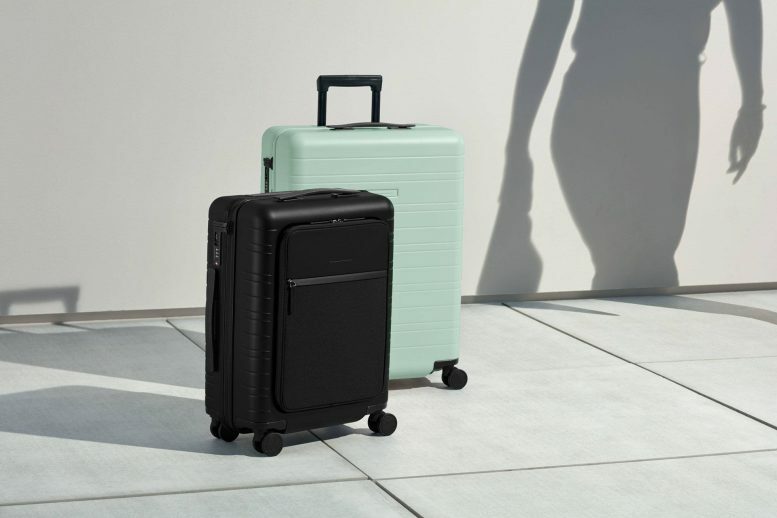 If you go for the hard-shelled suitcases, choose the ones made from durable materials that can’t break or crack such as the aerospace-grade polycarbonate that is able to absorb external pressure. The handles should be sturdy enough and so should be the wheels. Broken handles or wheels can cause you to drag around a heavy suitcase which is not only uncomfortable but tiring. You should opt for 2-bar handles if you are buying the cheaper options although a single bar handle can do if you are going for more expensive and durable models. Look for suitcases with skateboard-like wheels rather than those made of hard plastic.